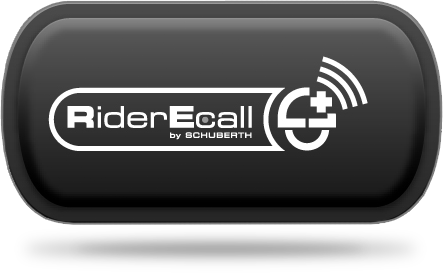 This was the official site for the 2012 introduction of Schuberth's Rider Ecall Rescue System. Content is from the site's 2012 archived pages and other sources. Renowned German manufacturer Schuberth announces the RiderEcall rescue system. RiderEcall is an optional accessory suitable for any bike and helmet and it will send GSM and GPS data in case of a crash. One of the factors which tend to make the situation worse after a bike accident is the rescue unit response. When thinking about crashes in the city area, things are rather simple, but with riders driving alone in the countryside, mountains and other remote areas, time is of the essence. The RiderEcall is a monitoring device with two modules: one of them is installed on the bike with the included mounting system, and the other sensor is easily attached to any type and make of motorcycle helmet. The bike-side unit also comes with an included power cord for a 12V DC bike socket and is waterproof. The head unit is encased in rubber and it is shielded against water, dust, cold (-20° Celsius) and heat (+60° Celsius). The helmet module monitors several values such as atypical acceleration and especially deceleration, bike tilt and helmet shocks. In case the recorded parameters exceed certain values, the Schuberth RiderEcall monitoring unit triggers the bike-mounted SOS device. The SOS unit comes with a SIM card and unique registration number and is in constant contact with the GPS satellites and the phone network. It will automatically call the emergency center and provide the GPS coordinates. The Schuberth RiderEcall monitoring is based on a yearly subscription, and that's how, each rider can be individually identified in case of an SOS call. Additional medical data made available at registration helps the rescue teams respond faster and more accurately to each emergency case. Given the many health conditions to be encountered among riders, proper ID helps eliminate potentially harmful treatments at the crash site (allergies, various intolerance syndromes and so on). The motorcycle unit is fastened on the motorcycle's handlebars using the universal mount supplied – just as simply as when you attach optional navigation devices. The only condition is a direct visual contact to the GPS satellites and an interference-free connection to the GSM mobile phone network. Naturally the system has also been tested in rigorous applications and is manufactured in accordance with IP code IP65. Protection is thus provided against water, dust, cold (-20° Celsius) and heat (+60° Celsius). The motorcycle unit is connected to the on-board socket of your motorcycle using the pre-installed power supply cable (DIN ISO 4165; 12V). The helmet unit consists of two parts: the actual helmet sensor and a weatherproof rubber cover which you attach to your helmet. To ensure that the helmet unit operates perfectly, the two parts are supplied already connected to each other. The helmet sensor is fastened to the helmet by means of a specially designed adhesive strip. We recommend that you position the assembled sensor at the centre of the rear of your helmet to avoid influencing the aerodynamic and aeroacoustic performance of the helmet. The helmet sensor can also be attached anywhere on the outside of the helmet shell, both vertically and horizontally. The SCHUBERTH RiderEcall is designed for the premium helmets from SCHUBERTH. However, it also fits helmets from other vendors (no guarantee). To activate the Schuberth RiderEcall System you must register the device at Schuberth.com. When it is registered, the device is set to your language and the integrated SIM card is released for the GSMN connection. AN ASIDE: It's been more than three years since Schuberth announced the RiderEcall rescue system. In that time I was hoping that the system would become available in the US. I spend a lot of time on my bike traveling to see customers of the company I work for: Rich Mountain Distribution. They specialize in the newest, best quality wholesale vapor products available. The customers I visit out here on the West Coast are vape stores and medical marijuanna dispensories. I love my job, but depending on the weather it can sometimes get hairy driving my motorcycle. Europe is so fare advanced when it comes to intelligent eCall systems. I just saw that BMW Motorrad which borrowed the eCall technology from its car division has been so well received that it’ll become mandatory for all new cars beginning in 2018. As for motorcycles, it will be available on all BMW bieks as an option beginning in 2017. eCall requires a connection to the mobile phone network in order to trigger the rescue chain. In the “intelligent emergency call” option, the connection is established via the permanently installed mobile communication unit. For the connection no specific mobile operator is required. All that is necessary is at least one operational mobile provider. The service will be made available in all European countries. Hello America, let's get with the eCall technology program. RiderEcall is an optional accessory suitable for any bike and helmet and it will send GSM and GPS data in case of a crash. carried out orders of goods or services by the principal - unless otherwise regulated by special arrangement - always to these Terms. These terms and conditions of purchase apply to companies, legal entities of public law and public funds. General terms and conditions of business of the Contractor is hereby contradicted. These are also not accepted by acceptance of the deliveries / services or by payment. 1.1 The delivery and performance definitions of the order issued by the customer (including enclosures) shall apply. 1.2 The customer may demand technical modifications to the delivery item even after conclusion of the contract, as far as this is reasonable for the contractor. In the case of this amendment, the effects, in particular on excess or reduced costs as well as the term design, have to be taken into account appropriately. 1.3 Subsequent oral / telephonic additions shall be effective only if they are confirmed in writing by the client, Purchasing Department. This also applies to this requirement. 2.1 The order has to be confirmed by the Contractor to the customer within 7 calendar days after the order date in writing (preferably e-mail to aufbesbestbestiftung@schuberth.de). The order shall also be deemed to have been accepted if the Contractor does not confirm or contradict it within the aforementioned period. 2.2.1 Unless agreed otherwise, delivery shall be free of all charges charged by the Contractor free of charge. Any dispatch must be reported to the customer without delay. The customer's order data, in particular order number, delivery address, article description, quantity / weight specification as well as the production date / lot number and, where necessary, storage requirements and material stability, must be indicated on the outside of the packaging, the shipping indicator and the delivery note. The delivery note must be attached twice. The client is entitled to reject non-duly performed / indicated deliveries at the contractor's expense. 2.2.2 Deliveries may only be made from Monday to Friday from 8 am to 5 pm (not on legal holidays and days of business rest). 2.2.3 The Contractor undertakes to check, before accepting an order, whether the goods or their components specified in the order are classified as dangerous goods (eg as paints, adhesives, chemicals or inflammable, oxidizing, explosive, combustible, toxic , Radioactive, caustic or self-heating items). In such cases, the Contractor shall inform the Customer of the current, national and international regulations (eg GefStoffV, GGVS, GGVSee, BioStoffV, UN / ICAD, IATA, EVO / RID, KVO / ADR) Observe additional regulations of the receiving country and send the necessary declarations (eg the corresponding EC safety data sheets) to the client correctly and send them in duplicate as soon as possible. 2.3.1 The risk of accidental transfer and the accidental deterioration of the goods shall be borne by the Contractor until delivery to the Customer. If the goods are returned as a result of a warranty, the risk is borne with the contracted back-loading. 2.3.2 The property shall be transferred to the customer at the receiving point at the latest upon completion of the unloading process. Any reservation of title shall be excluded. 2.3.3 The ownership of manufacturing means (eg tools) used by the contractor for the production of the goods and services and paid by the customer shall be transferred to the customer by payment of the order by the customer in accordance with §§ 929, 930 BGB Contractor, as the property of the client, to maintain it and to insure it adequately. At the customer's request, the manufacturing agents shall be issued without delay to the customer. If co-ownership of the Contractor is established, the transfer shall be effected by way of payment in return for remuneration of the co-owner. If there is disagreement about the amount of the co-ownership, the client may, by providing a guarantee in the amount of the disputed amount, withhold a right of retention on the part of the Contractor. A use of these manufacturing agents by the contractor for third parties requires the consent of the customer. 2.4.1 The Contractor will only send tested and approved parts and the Customer may waive a detailed inspection. 2.4.2 In the case of an examination of the production stage and / or of the quality processes at the contractor, the customer shall be given unhindered access to the production plants concerned upon prior registration at the usual business hours of the contractor. 3.1 The delivery and performance dates specified in the order are binding entry dates at the prescribed delivery address. If the Contractor recognizes that the agreed dates can not be adhered to, the Contractor must notify the Client immediately in writing of the reason and duration of the delay. If a contractual penalty has been agreed for the event of late delivery, further legal claims of the customer remain unaffected. The customer may demand the contractual penalty up to the final payment or set off against payments due, even if the service has been accepted without reservation. 3.2 Natural catastrophes, strikes, lockouts, official measures, transport and operational disturbances in the work of the client or in the area of ​​its suppliers, which lead to a restriction or discontinuation of its production or prevent it from transporting the ordered goods Than two months, of its purchase commitments. Claims of the Contractor for the consideration and damages are excluded in these cases and for this time. The agreed prices are binding and fixed for the duration of the order, free plant or predefined delivery address, including commercial and environmentally friendly packaging, and transport insurance. 5.1 Invoices must contain the order data, in particular the order number. At the latest with the invoice, the Contractor shall complete and sign the proof of origin required by the customer, such as the Contractor's Declaration of Conformity and the Certificate of Conformity, as well as test certificates. The same applies to VAT-based proofs for foreign and intra-Community deliveries / services. 5.2 From the date of the invoice / certificate of origin and performance, the payment shall be made within 21 days with a 3% discount but without acknowledgment of the contractual nature of the delivery / service. 6.1.1 The Contractor guarantees that the delivery / service is free from defects, is suitable for the agreed purpose and has the agreed upon nature of the order. In the event of wearing parts, the Contractor guarantees that these exceed at least the usual number of operating hours without defects. The Contractor shall ensure that his delivery / performance is in particular in accordance with the rules of technology and the state of the art, the regulations and directives issued by the legislature, the supervisory authorities and professional associations and the applicable EU directives with regard to execution, accident prevention and environmental protection Environmental impact assessments required for the product type. 6.1.2 The warranty period shall be 36 months from the date of delivery to the customer. This also applies to spare parts from installation / completion of the repair work. The warranty period is extended by the standstill times of the customer's product, as far as these are caused by defects and defect removal work. 6.1.3 The customer shall immediately notify obvious transport damage or defects at the latest 5 days after discovery (see also 2.4.1.). In this respect, the Contractor waives the objection of the delayed notification of defects. The Contractor shall immediately rectify any deficiencies at the Client's option by removing the defect or by delivering a defect-free product. The Contractor shall bear all costs resulting from the supplementary performance, in particular installation and removal costs, transportation and disposal costs. In addition, the customer is entitled to the statutory rights to rescission, reduction and compensation as far as the legal requirements are met. 6.1.4 In case of urgent need, delay of the contractor with the defect elimination, unreasonableness of the supplementary performance by the Contractor or refusal of the Contractor to remedy the deficiencies, the Client is entitled to remedy the deficiencies themselves at the expense of the Contractor . This shall not affect the statutory rights of the customer. 6.2.1 The Contractor shall release the Customer from claims for damages which are asserted against the Customer on account of a product defect to be attributed to the Contractor. 6.2.2 The Contractor shall provide proof of the existence of a product liability insurance in sufficient amount on request. If the contractor fails to prove or refuses to make a reasonable increase in the insurance sum as proposed by the customer, the customer shall be entitled to withdraw from the contract and to claim damages. 7.1 The Contractor warrants that all deliveries are free of third party protective rights and that patents, licenses or other proprietary rights of third parties are not infringed, in particular by the delivery and use of the delivered goods. 7.2 The Contractor shall indemnify the Customer and its customers from claims of third parties arising from possible infringements of the intellectual property rights and shall bear all costs incurred by the Customer in this connection. In particular, the customer shall be entitled, at the expense of the Contractor, to authorize the use of the protected rights in question by the entitled party. The client may withdraw from the contract at any time wholly or in part if the adjudicating or judicial settlement or insolvency proceedings are opened over the contractor's assets. 9.1 The contractor is obliged to treat all non-public business information, which is accessible to him by the contractual relationship to the client, as a business secrecy and not to disclose to third parties even after termination of the contractual relationship. 9.2 The client reserves all rights of ownership, copyrights and other proprietary rights in drawings, models, tools, production materials, construction plans, recipes and all other information and objects submitted to the Contractor for the execution of the order and in the know-how embodied therein. The information and objects provided may only be made available to third parties only to carry out the order and only with the prior written consent of the customer. They may only be used by the Contractor for the execution of the respective order and must be returned at the request of the customer immediately, in principle, however, after completion of the order. The Contractor shall carefully maintain, maintain, maintain, designate and adequately insure the property of the Client. 10.2 The assignment of payment claims from this contract as well as the engagement of subcontractors or suppliers requires the prior consent of the client. Any consent does not affect legal responsibility. 10.3 For the interpretation of trade clauses, the INCOTERMS shall be valid as of the final version at the time the contract is concluded. 10.4 The place of performance for deliveries and services shall be the place of destination specified in the order. 10.5 German law applies to the exclusion of the UN purchase right. The contract language is German. 10.6 Should any provision of these General Terms and Conditions be or become invalid in whole or in part, this shall not affect the validity of the remaining provisions. 10.8 The Client, however, reserves the right to sue the Contractor at any other competent jurisdiction. 1) Our terms of sale apply exclusively; We do not accept any terms of the customer which differ from our terms of sale, unless we have expressly agreed to their validity in writing. Our terms and conditions of sale also apply if we make the delivery to the customer unconditionally in the knowledge of conditions of the customer which differ from our sales conditions. 2) All agreements made between us and the customer for the purpose of the execution of this contract shall be made in writing. 3) Our sales conditions apply only to entrepreneurs, legal persons under public law or public special assets in terms of § 310 para. 1 BGB. 4) Our sales conditions also apply to all future transactions with the customer. 1) Our offers are free and non-binding. Declarations of acceptance and all orders require the legal validity of our written or telegraphic confirmation. 2) Our representatives or other auxiliaries are not authorized to make oral ancillary agreements or give verbal assurances that go beyond the content of the written contract. 1) Delivery dates or deadlines, which can be agreed bindingly or without obligation, require the written form. 2) Delivery and performance delays due to force majeure and due to events which not only temporarily make delivery more difficult or impossible for us - including, in particular, strike, lock-out, official orders, etc., even if they occur with our suppliers or subcontractors - we are not responsible for binding deadlines and deadlines. They entitle us to suspend the delivery or service by the duration of the hindrance plus a reasonable start-up time or to withdraw from the contract in full or in part because of the part not yet fulfilled. 3) If the hindrance lasts longer than two months, the customer is entitled to withdraw from the contract with regard to the part not yet fulfilled. If the delivery time is extended or if we are released from our obligation, the customer can not derive any claims for damages from this. We can only rely on these circumstances if we notify the customer immediately. 4) Insofar as we are responsible for non-binding deadlines and deadlines or if we are in default, the customer is entitled to a default payment of 0.5% for each week of the delay, but not more than 5% of the invoice value Of the goods and services affected by the delay. Any claims beyond this are excluded, unless the default is due to our gross negligence or intent. 5) We are entitled to partial deliveries and partial services to a reasonable extent. 6) Compliance with our delivery and service obligations requires the timely and proper fulfillment of the customer's obligations. 7) If the customer is in default of acceptance, we are entitled to demand compensation for the damage caused to us. Upon the occurrence of the acceptance delay, the risk of accidental deterioration and accidental loss will pass to the customer. Our prices are ex works, unpacked and uninsured. Unless otherwise agreed, shipping will be carried out on the account of the customer in a commercial manner, without responsibility for the cheapest shipping. The risk shall pass to the customer in accordance with § 447 BGB (German Civil Code). 1) Only the product description attached to the contract is decisive for the quality of the goods sold by us. 2) Deficiency claims of the customer presuppose that the customer has properly complied with his investigation and complaint obligations due pursuant to § 377 HGB. In the case of obvious defects, the customer shall only be entitled to warranty claims if the defects are notified to us in writing within 10 days after delivery. 3) If there is a defect of the purchased item, we are entitled at our discretion to supplementary performance in the form of a defect removal or to supply a new defect-free item. In the case of the rectification of the defect, we shall only bear the expenses for the remedying of defects, such as labor, material, transport and travel costs, insofar as these expenses are not increased by the fact that a delivery item has subsequently been transferred to another place as the seat of the customer, Unless this shipment corresponds to the intended use. 4) The customer has to provide us with a sufficient period for supplementary performance which may not be less than 20 working days from the date of the notification of the defect. Any complained goods may only be returned with our approval. 5) If the supplementary performance fails, the customer is entitled, at his discretion, to demand rescission or reduction. 6) We are liable according to the statutory provisions, if the customer assert claims for damages based on intent or gross negligence, including intent or gross negligence of our representatives or vicarious agents. Unless deliberate breach of contract is involved, liability for damages shall be limited to the foreseeable, typically occurring damage. 7) We are liable according to the statutory provisions insofar as we are guilty of a material contractual obligation, ie a duty, the fulfillment of which gives the contract the stamp and on which the customer may rely. In this case, however, the liability for damages is limited to the foreseeable, typically occurring damage. 8) For negligence, our liability is limited to € 7.500.000,00, unless the damage was deliberately caused. 9) Liability for culpable injury to life, body or health shall remain unaffected; This also applies to mandatory liability under the Product Liability Act. 10) Unless stated otherwise, the liability is excluded. 11) The limitation period for claims for defects shall be 12 months, calculated from the passing of the risk. 12) The statutory period of limitation in the case of a supply regress pursuant to Sections 478, 479 BGB shall remain unaffected; It shall be five years from the delivery of the defective goods. 1) Any further liability for damages than in these general conditions of sale is excluded - without regard for the legal nature of the claim asserted.This applies in particular to claims for damages resulting from negligence on conclusion of the contract, due to other breaches of duty or due to delictual claims for compensation for property damage pursuant to § 823 BGB. 2) The limitation pursuant to para. 1) shall also apply insofar as the customer requires replacement of useless expenses instead of a claim for compensation for the damage. 3) Insofar as the liability for damages is excluded or restricted, this also applies to the personal liability for damages of our employees, employees, employees, representatives and vicarious agents. 1) We retain ownership of the purchased item until all payments from the business relationship with the customer have been received. In the case of a breach of contract by the customer, in particular in the event of a delay in payment, we are entitled to take back the purchase item. In the withdrawal of the purchase object by us is a rescission of the contract. After redemption of the goods, we are entitled to use them, the proceeds from the sale must be credited to the customer's liabilities - less appropriate costs of realization. 2) The customer is obligated to handle the purchase item with care; In particular, he is obliged to insure these at his own expense against fire, water and theft damage at his own expense. If maintenance and inspection work is required, the customer must carry it out in time at his own expense. 3) In the case of attachments or other interventions by third parties, the customer must immediately notify us in writing so that we can bring an action pursuant to § 771 ZPO. Insofar as the third party is not able to reimburse us for judicial and extrajudicial costs of an action pursuant to § 771 ZPO, the customer shall be liable for the loss incurred by us. 4) The customer is entitled to resell the purchase item in the ordinary course of business; However, he already assigns to us all claims in the amount of the final invoice amount (including value-added tax) of our claim arising from the resale against his customers or third parties, irrespective of whether the purchased item has been resold without or after processing . The customer shall remain authorized to collect this claim even after the assignment. Our authority to collect the claim itself remains unaffected. However, we undertake not to collect the receivables as long as the customer complies with his payment obligations from the revenue collected, is not in arrears with payment and, in particular, no application for the opening of a settlement or insolvency proceedings is filed or payment is settled. If this is the case, we can demand that the customer notify us of the assigned claims and their debtors, make all necessary information for collection, hand over the related documents and notify the debtors (third parties) of the assignment. 5) The processing or conversion of the purchased item by the customer is always made for us. If the object of purchase is processed with other items not belonging to us, we acquire the co-ownership of the new item in proportion to the value of the purchased item (final invoice amount including VAT) to the other processed items at the time of processing. In addition, the same thing applies to the goods resulting from the processing as for the purchased goods delivered under reservation. 6) If the object of purchase is inseparably mixed with other items not belonging to us, we acquire the co-ownership of the new item in proportion to the value of the item purchased (final invoice amount, including VAT) to the other mixed items at the time of the mixing. If the mixing takes place in such a way that the customer's item is to be regarded as the main item, then it is agreed that the customer transfers us jointly co-ownership. The customer shall store the resulting sole proprietorship or co-ownership for us. 7) The customer also assigns to us the claims for securing our claims against him, which arise by the combination of the purchased object with a property against a third party. 8) We undertake to release the collateral to which we are entitled at the customer's request insofar as the realizable value of our collateral exceeds the claims to be secured by more than 20%; The selection of the collateral to be released is our responsibility. 1) The sale of goods from our deliveries is only allowed to end users and such dealers who are also supplied by us or our respective national importers. At the request of the purchaser, we will inform you in detail whether a dealer is supplied. 2) The sale of our goods via platforms such as ebay, Amazon or comparable as well as Internet pages, which do not correspond to a qualitatively highlighted product presentation and the branding of our products is in principle not permitted. 1) The payment is due with invoice receipt purely net, unless otherwise agreed. 2) The deduction of cash discount requires special written agreement. In addition, cash discount is granted to the customer only if he has fulfilled all our previous requirements. 3) Bills of exchange and checks shall only be deemed as payment after payment. Bills of exchange shall only be accepted after prior written agreement, all additional charges shall be borne by the customer. 4) The customer is entitled to set-off rights only if his counterclaims have been legally established, undisputed or acknowledged by us. In addition, he is entitled to exercise a right of retention insofar as his counterclaim is based on the same contractual relationship. 5) We are always entitled to assign our claims, especially in the framework of factoring. Customer's contrary terms of purchase are not applicable. 6) Our receivables are currently transferred to BFS finance GmbH, Verl. Payments can therefore only be made to BFS finance GmbH with a debt-exempt effect. The bank details can be found on the invoice. If the buyer is in default with the payment of the purchase price, he shall be liable to default interest of 10% above the base rate of the ECB during the period of default. 1) Without our express consent neither the contract concluded with us nor any individual claims from the contract may be transferred to third parties in whole or in part. 1) By purchasing our goods, the use of our copyrights is only connected to the extent that it is necessary to use the individual product. The technical analysis, the exploitation of communicated procedures or the extended use of copyrights is excluded. 2) Furthermore, the advertising of our products beyond the customary business or advertising with us as business partners is excluded. 1) If the customer is a merchant, a legal person of public law or a public special fund, Magdeburg (our place of business) is the court of jurisdiction.In payment matters, the customer may also be sued in Gütersloh or his place of business at the option of the creditor. 2) Unless otherwise stated in the order confirmation, our place of business is the place of performance for delivery and payment. 14. Final provisionsThe right of the Federal Republic of Germany shall apply. The validity of the UN purchase law is excluded.